Creating a Work Schedule – Plus Free Template! When you’re managing resources a work schedule is crucial to keep track of progress and status, Jennifer Bridges, PMP, recommends building one with an employee scheduling tool. Jennifer noted that a work schedule is something project managers are always using as a way to organize their day and their team members’ time. It’s made up like a calendar, she said, with days of the week and then that is broken down into hours of the day. This way you can easily track the time on the job or project for your team or contractor. There are many steps to creating a schedule in project management, which is sometimes referred to as a roster, which is often associated with a shift, season, time period or, in our case, a project. After showing what a work schedule for a project looks like — basically, a grid with a column for team members and then columns for the days of the work week broken down hourly — but she explained there can be challenges to this simple structure. The problems with using something static like an Excel spreadsheet or, worse, paper, is that it’s not easily accessible for team members. While it functions well to schedule work, if there are changes or someone wants to update their work schedule, the process is inefficient and likely not reflect all the iterations accurately. Still, you need to have a work schedule, and Jennifer outlined the basics to help you make one easily, including all the information you’ll need it to collect. Pro-Tip: To make your work schedule even better, you’ll want to migrate it online with a pm software tool that can help your team access it to update and share. Another tip about online scheduling software is that your schedule is updated instantly to your dashboard, giving you greater insight and thus control of your project. Take it further: As an extra bonus, download this free Excel Work Schedule template to help streamline your process and manage your team’s schedules. Get a Free Work Schedule Template! 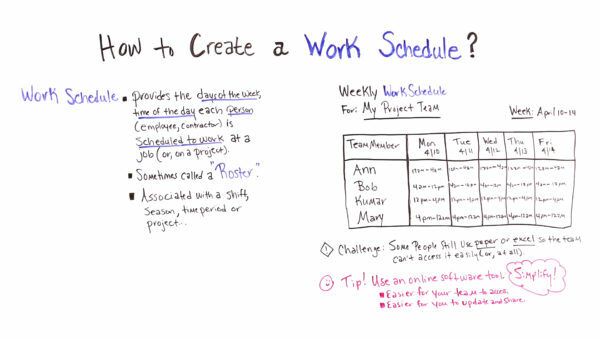 Today, we’re talking about how to create a work schedule. Well, the truth is we use work schedules all the time, whether they’re informal or formal. I have a schedule for my work. I know that I go to work Monday through Friday at specific hours of the day. If you think about the restaurant business, that’s how they schedule their workers. Different utilities schedule their workers through shifts. So, let’s take a look at what a work schedule is composed of. So, work schedule provides the days of the week, the time of the day that each person, whether they’re an employee or contractor, is scheduled to work on a job. And in our case, it could be a project. So, sometimes it’s called a roster. So, it has all the people listed and when they’re due to work. It also can be associated with a shift, a season, a time period, or, again, a project. So, let’s look at what one looks like. So, here’s what a project schedule can look like. And, again, when we’re creating one, we highly recommend using a template. That way, number one, it’s easier, it’s quicker, but it also helps to keep things consistent. So, this is a weekly work schedule. So, it’s for the purpose of my project team. And I have the time period for a week, I’m tracking my team members’ time for a week. So, from April 10th to the 14th, and that’s Monday through Friday. So, if we look here, we have all the team members, Monday through Friday. And, so it shows that Ann is scheduled Monday through Friday, from 12 a.m. to 4 a.m. And then, Bob is scheduled Monday through Friday, 4 a.m. to 12 p.m.
Kumar is scheduled from 12 p.m. to 4 p.m. And then, Mary is scheduled Monday through Friday, 4 p.m. to 12 a.m. So, in this case, their shifts…and this ensures that I have all shifts covered and I know who is working when. But a challenge is, today is, some people still use paper or Excel to create and track their work schedule. But the problem is that the workers, or your team, can’t access…easily access, or access it at all to see what their schedules are. So, a tip is to use an online software tool. It helps to make it easier for your team to access so that they can see their work schedule, see if there are any changes made. And it’s also easier for you to update and share with your team members. So, this is more about a work schedule. And if you need a tool that can help you with your work schedule, then sign up for our software now at projectmanager.com.